More neon orange than golden, but let's not get nit-picky. The sun was out today, I was in a fantastic mood and this bright, luscious salad seemed like the perfect thing to have for lunch. 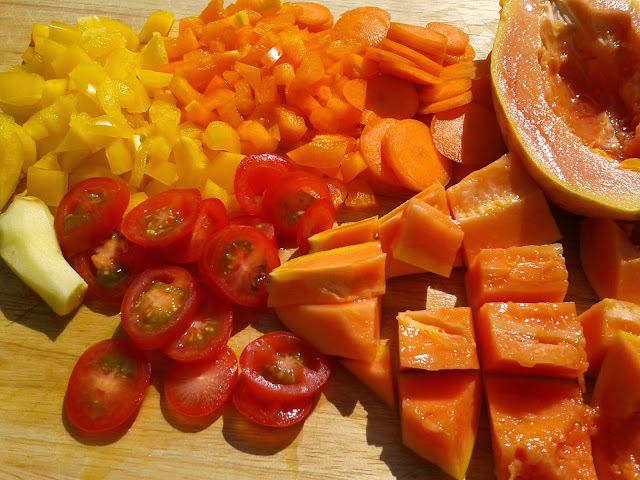 I've used pawpaw/papaya in a sweet dessert recipe before, but wondered how it would fare with other savoury ingredients. Verdict? Absolutely incredible. I chopped one half of it into chunks for the salad and used the other half to make a rich papaya-ginger-tomato dressing (oil-free). Sooo yummy. I've used a mix of spinach and lettuce leaves for the salad base, but any leafy greens you've got available will do the trick. Top it off with a mix of other bright vegetables and you're good to go. This would be great to take along to a summer party or family gathering. 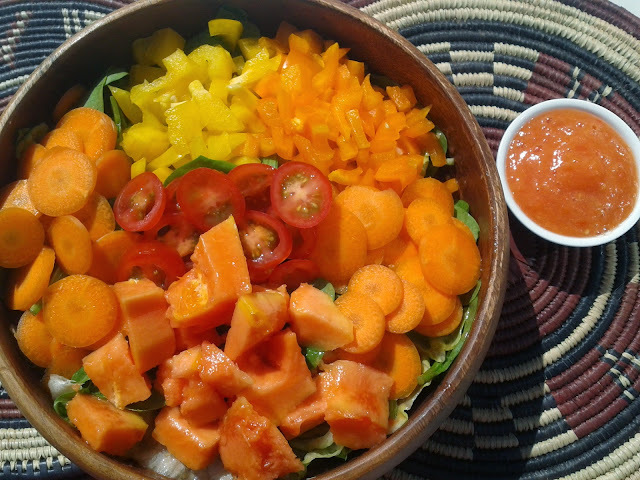 To make the dressing, blend half the papaya with a bit of fresh ginger, the 2 medium tomatoes and the juice of one lemon. Place the mixed greens at the bottom of a large salad bowl, add half of the salad dressing and mix until all the leaves are coated. 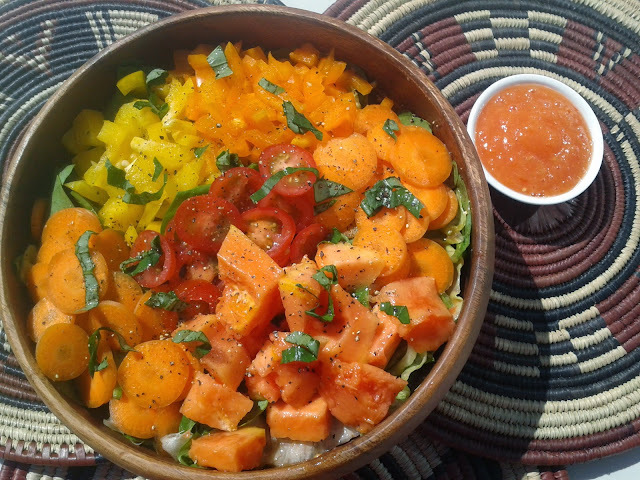 Arrange the chopped fruit and vegetables on top, sprinkle on some ground black pepper and garnish with chopped basil or partminger. Drizzle on the rest of the dressing and serve immediately. If you're making it ahead of time, then don't add the dressing until you are ready to serve (to stop the leaves from going soggy). I know what you mean. If I don't smother the raw veggies in a sauce or salad dressing (with lots of pepper! ), I have a hard time with it too.